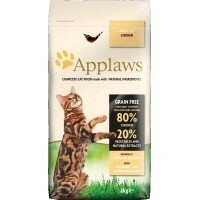 Applaws Adult Dry Cat Food (Chicken) is a complete grain free cat food made only from 100% natural ingredients. Containing a high meat content of free run chicken and bolstered with 20% vegetables and healthy natural extracts, Applaws Adult Cat Food is naturally hypo-allergenic and full of pre-biotics and pro-biotics to support your cat’s health. I buy Applaws wet food from here and knowing what high quality it is, decided to get some of this dry food when it appeared on the website. My cats are fussy eaters but they really love this. I scatter it on top of their dinner every evening to add a bit of crunch and it always gets eaten. For a premium dry cat food it is a good price. Really good value for money, my cats love it and they have never has such shiny coats, they look healthier in every way. I have a 5 year old cat and a 17 year old cat and this is the only food that seems to work well for both of them. Would recommend this product! !